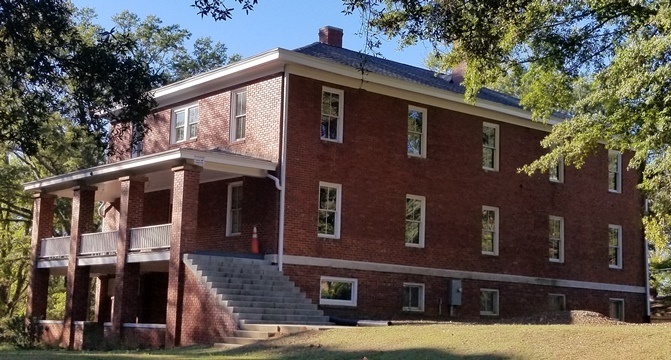 Brainerd Institute was one of the earliest and finest of the many private schools established for freedmen in South Carolina in the years just after the Civil War. Brainerd was operated from ca.1868 until 1940 by the Board of Missions of the Presbyterian Church, USA and offered vocational, industrial, mechanical, classical college preparatory, and teacher training. From 1868 until the turn of the century Brainerd provided the only schooling available for black children in Chester, and it provided the only high school until the 1920s. Brainerd occupied several locations before finally settling on the present site, the old DeGraffenreid land, where the mansion house was utilized as the main building. Brainerd was a feeder school for many colleges, including Benedict College, Johnson C. Smith University and Howard University. Decline in enrollment and financial problems forced Brainerd to close, and she graduated her last class in 1939. The property is now owned by Mrs. Vivian Ayers, a member of this last class and the mother of Phylicia Rashad and Debbie Allen. Kumler Hall is the only remaining building on the once active 21-acre campus. It is significant as the only intact physical reminder of one of the finest and most successful elements of this unique educational system for blacks. Efforts are under way by Mrs. Ayers to beautify the campus and to preserve and restore this building. A historical marker commemorating Brainerd is erected on the Lancaster Street side of the campus. Listed in the National Register January 27, 1983.